I think this set is just about the most fun I've had making cookies in awhile:) They are super simple! 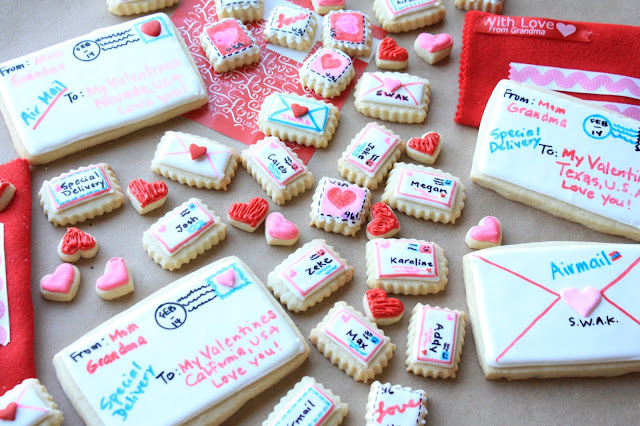 If you can hold a pen and write, you can make these cookies too, lickety-split! They are all sugar cookies with white royal icing, decorated with edible markers:) I did add a couple of royal icing hearts as postage stamps (and some tiny heart cookies) here and there, but that was about it. 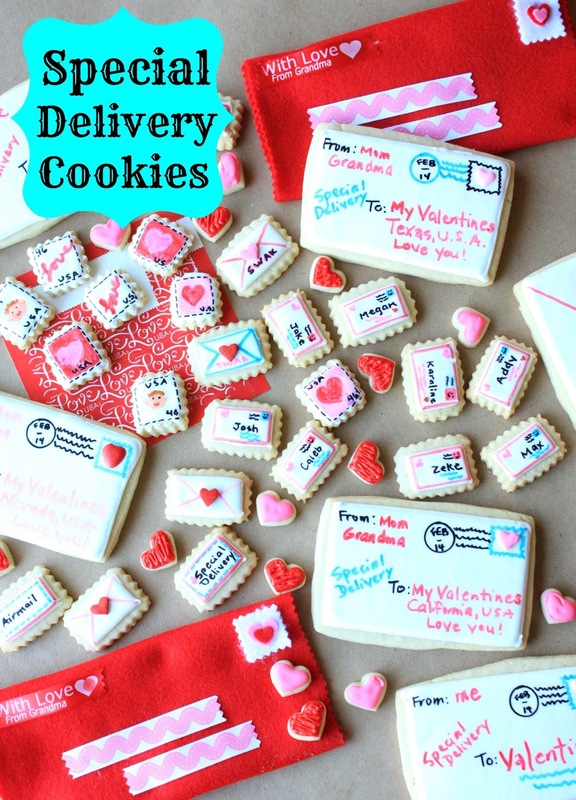 I even went out of my comfort zone and made them each a handmade, felt envelope for the biggest cookies of the bunch. It would have looked really cute with stitching, but I haven't used my sewing machine in ages, and was short on time (excuses, excuses), so resorted to the good ol' glue gun to hold the envelopes together! Velcro fastens in the back to close them up. I adore felt crafts, and admire so many all over the internet, that I was finally happy to have completed one craft with felt, simple though it was. Next time, I vow to get my sewing machine out of the closet! Did you notice the personalized "With Love from Grandma" ribbon? I purchased it from Pick Your Plum and I love it! 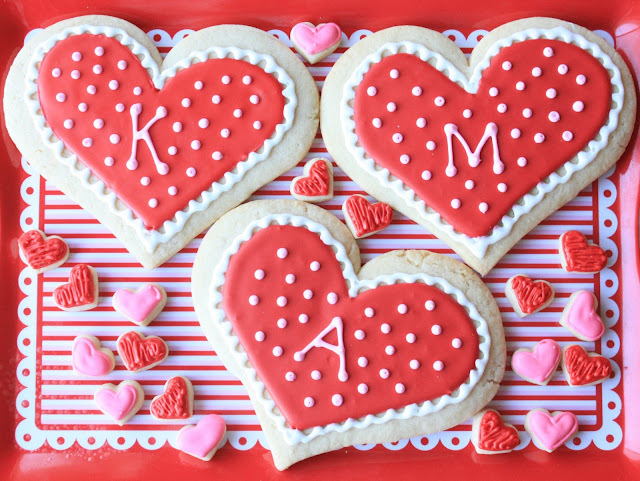 I also made these big heart cookies for each of my granddaughters with their initial, and made my grandsons, robot cookies. I hope they'll all be my valentines! XOXO to each of them! These are the cutest Valentine's I've ever seen! I have to tell you that I used this idea tonight for cupcake toppers for a Vday order I am doing....I had a different theme going UNTIL I saw this cute idea...I will have to show you, thanks SO MUCH for this inspiration, they really are so cute, such a neat idea, Sue! I can't wait to see your cupcakes! I know they must be cute! These are s cute! I love the idea of little edible letters! They will absolutely adore them I am sure! Aren't these just the cutest? I'd love to get one of these. Your pictures are great! PS: these cookies are to die for, I love them!!! Your attention to detail is fabulous. Love every little bit of these sweet treats. Bravo! These are amazing cookies! and I love the teeniest tiniest envelope cookies the best! They are so cute! Aww so cute. Can you drop one in the mail to me? I wish I had this talent! As useall loving you beautiful cookies. These are so gorgeous and I love the robot cooikes too. Lovely! It looks really beautiful! This is such a sweet idea, missed the chance to make it this valentines day but bookmarking it for next year definitely!! Ok, I know VDay has passed...but I found you over at Tip Junkie via a totally different recipe! I'd love for you to come link this up at my Tuesday Time Out! Such great detail! Really sweet idea for Valentine's day to include everyone. Well done on those cute little pouches too!